Colourful sweet potato croquettes, loaded with flavour and healthy nutrients, make a tasty light meal with a side of pasta, rice, or couscous. Or serve them as a filling appetizer for your next event. Any time I have an extra sweet potato lurking about, croquettes have become one of my top picks to make. Savoury sweet potato croquettes are an enticing way to get healthy superfoods onto our plates and into our lunch boxes. 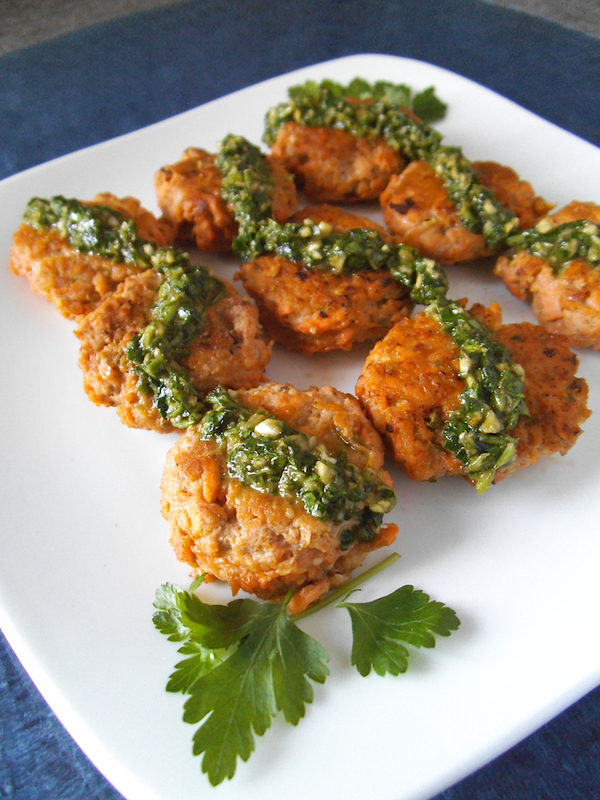 The sweet potato and chimichurri sauce can be prepared in a snap, thanks to my food processor. Leftover croquettes make a great breakfast too, since they taste almost like sausage. We had plenty of chimichurri sauce left, but found that the extra sauce adds a fantastic garlic punch to meats, sandwiches, and pasta as well. The sauce can also be frozen for next time. And since there is no cilantro involved in this chimichurri, my whole family could enjoy it! What are your favourite ways to eat sweet potatoes? Mash together ground chicken and sweet potatoes with your hands or a potato masher. Add remaining croquette ingredients and mix thoroughly. Form the seasoned mixture into small patties. Heat a large skillet over medium heat and grease lightly with oil. Fry the croquettes for several minutes on each side until cooked through, being careful not to let the sweet potato burn. Cover and keep cooked croquettes warm. Toss all ingredients for the chimichurri sauce into a food processor or blender and pulse until a thick sauce forms. Serve croquettes warm with sauce on the side or top croquettes with the sauce just before serving. Thanks! They are definitely worth repeating! this looks delicious! Your photography is beautiful- you’re making me hungry! this is a very unique recipe, I haven’t seen chicken and sweet potatoes combined like this. Thanks for sharing! Merci beaucoup! I haven’t tasted anything quite like them before either, but the blend of flavours really works. I bought almond flour from iHerb recently for a recipe. I can now no longer remember what recipe I wanted it for but these will be a nice substitute as I can get all the ingredients here in Korea! Thank you! Will let you know when I make them and how they turn out! And yes, I’ll let you know. I’ve been wanting some new recipes and this is going to the top of the list. I like to extend meat patties, but I hadn’t thought of trying sweet potato, this sounds really yummy, will try. I love sweet potatoes so I will try this recipe soon. Look so yummy! looks like a great combo! Featuring your recipe this week, thanks for sharing it on Allergy Free Wednesday! Thanks, Tessa! I look forward to seeing what’s shared each week! Hi there! Stopping by from the Monday Funday link party! This looks so delicious and I love chimichurri sauce! Thanks so much for the recipe! Pinned! Thanks for stopping by! Hope you enjoy the recipe! Thank you, Kat! 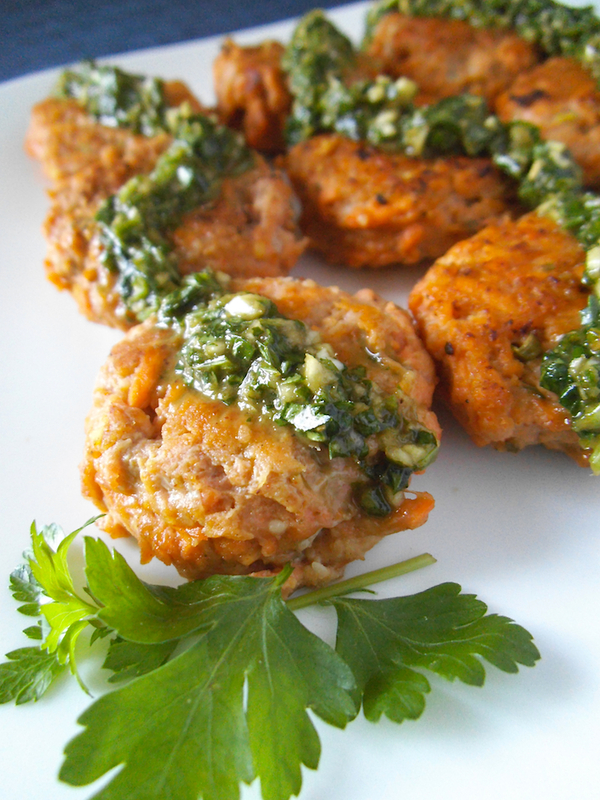 Have you tried chimichurri sauce before? This recipe was my first time. I can’t eat eggs- how well do you think this recipe will work without the egg? These croquettes look delicious! I love the chimichurri sauce! 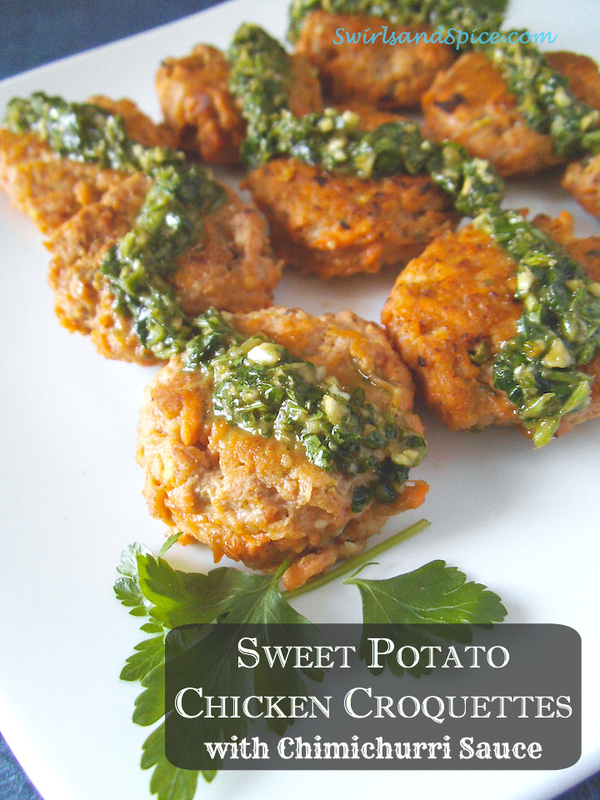 We are big fans of sweet potatoes and I am always looking for new ways to make them!